We are a group of individuals who love Greyhounds. We enjoy getting together to talk about our hounds, while educating the public on Greyhound racing as well as Greyhound Adoption. We do this through activities in the community. 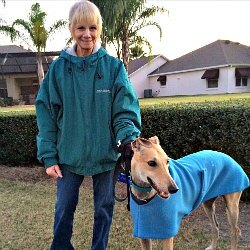 Our Greyhounds love spending time with each other at gatherings in the town squares, here in The Villages and other venues in our area. If you are interested in joining our group, even if you do not have a Greyhound, you are most welcome! Please feel free to contact me at 352-753-6563. Please Note: Events may be cancelled due to weather ... please check with us before attending.